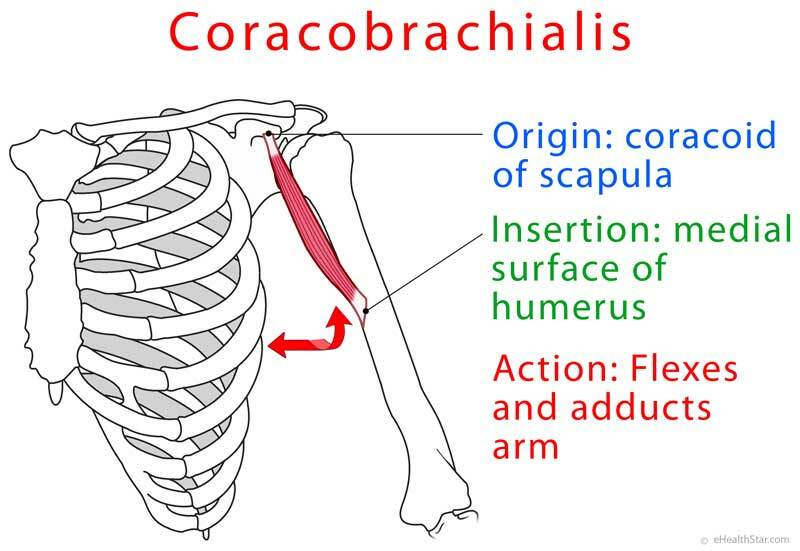 Coracobrachialis extends from the top of the shoulder blade to the inner side of the upper arm. Coracobrachialis pain appears in the front of the shoulder as a result of strain or, rarely, tear. The test for coracobrachialis pain includes reaching with the affected arm behind the back and trying to grab the shoulder of the opposite arm. If coracobrachialis is affected, such move is painful or impossible to do . Raise your arm forward and hold it with the elbow at the shoulder level, the forearm pointing to the ceiling and the palm facing to the floor. Then push your upper arm up against an examiner’s resistance (Video 2).